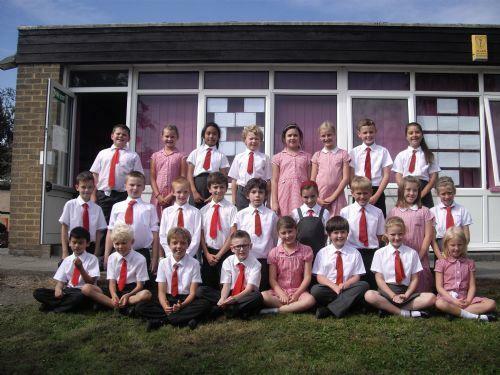 We are the Year 5 class and our class teacher is Mrs Bower. Our teaching assistant is Mrs Roberts. Currently, we are working with year 6 on our end of year production of Robin Hood. HOMEWORK - SONG WORDS FOR THE PLAY!! Keep coming back through 2014 to see us! A busy week that was filled with transition days. You all worked hard for Mrs Grimes and produced some lovely work for her! Not long now until you are actually in there all the time!! Congratulations to our award winners this week. Don't forget - NO SCHOOL ON MONDAY!! Our final week of this half term has been filled with tests! You have all tried very hard and should feel very proud of yourselves. All of you also worked hard in producing a beautiful Liturgy on Wednesday! Whether you were reading or were part of the team that set up the seats, flowers, prayers and tealights, it was a team effort so very well done! Congratulations go to our award winners this week! Michael - Courtesy award for always being one of the first to volunteer to do jobs! Everyone - good work award for producing a beautiful Marion Liturgy. Dylan - maths awards for the techniques used in his maths tests. Enjoy your week off now Lourdes - remember about your homework task for the first Monday back. See you in June!!! Another busy week here in Lourdes class. This week our focus in Science was to see which condition would help cress seeds to germinate the best over the week. We had some great results! Also this week we started looking at some books written by Raymond Briggs. 'UG' was a popular one along with 'Fungus the Bogeyman'!! Harry - star writer for his book review on 'UG'. Athena - courtesy award for always having a bright, cheery smile on her face! Gosia - Good work award for her R.E. work on how the Holy Spirit transforms our lives. Euan - maths award for his subtraction with decimals work with Mrs Roberts. Don't forget our Marion Liturgy is on Wednesday next week - I shall hand out readings for you to rehearse at home, on Monday! Thank you children for the lovely card and flowers you have given to me today for my birthday! We have had another busy week, especially planning our cress growing experiment. Fingers crossed for good results next week! Congratulations to our award winners this week too. James - Star writer for his prayer about the Holy Spirit. Scott - Maths award for his column addition work. Niamh & Grace - good work award for their wonderful first prayer meeting as part of our new Chaplaincy team. EVERYONE - courtesy award for excellent beaviour, manners and team work at Beaumanor. No celebration assembly this week as we are at Church on Friday morning for our start of term mass @ 9.30am. Welcome back everyone. You were all very excited to tell me about your Easter holidays on Tuesday. Your homework projects on a mountain range were superb and it was evident that you put a lot of hard work into them and also into your sewing work. WELL DONE! Congratulations this week go to our acheivement winners. Grace - Star Writer for her Big Writing on her Easter Holidays. Millie - Courtesy Award winner for always being polite to others. Marie - Good Work award for her reading and for filling in her reading journal every day! Holly - Mathematician award for her work on line bisectors. Have a lovely RELAXING weekend in preparation for our big residential trip next week to Beaumanor! No celebration assembly this week as we are at Church on Friday morning for our end of term mass @ 9.30am. Well done everyone for your Mother's Day themed assembly on Tuesday. I am very proud of you all for keeping it all a surprise! Well Done to Dylan for being named the Super Scientist in our class for his planning, predictions and conclusions in our investigation for Science Week last week. Another week has flown by with much to celebrate. Good Work - Myco for his sewing work on his Angry Bird. Courtesy - Holly for always being polite and friendly to others. Mathematician - Niamh for her work on Venn & Carroll diagrams. Star Writer - Michael for his story The Orange Planet. Don't forget about Mother's Day this weekend and that the clocks 'spring forward' an hour! One week left Lourdes - let's dig deep for the final week of our topics! What a week we have had Lourdes Class - a short one too with our INSET day on Wednesday! 'How does sound travel?' - pictures to follow!! REMEMBER - class assembly on TUESDAY @ 2.50PM. Please encourage your mum to come as the theme is Mother's Day! We look forward to seeing as many mums there as possible!!! Keep going Lourdes - 2 weeks until Easter now! It's been another busy week in Lourdes class! Well done to everyone for starting their backstitching sewing work in DT. You now have 2 weeks to perfect your sewing skills before you join your textiles together. We started reading Alice in Wonderland this week too in Literacy. Congratulations go to our award winners this week. Cianan won the courtesy award for always being a helpful member of the class. Marie won the mathematician award for her rapid number bond answers. James won the good work award for his backstitching work in DT - he tried very hard and had lots of patience threading his needle and then doing the sewing! Gosia and Harry are our star writers this week for their Old Father William poems - excellent rhythm and rhyme, following the pattern from the original. Dont forget - next Wednesday is an INSET day and next Friday is Sport Relief Day. Also try hard to bring a copy of Alice in Wonderland in to read along in our Literacy lessons! It's great to be back this week with you Lourdes Class!! I have missed you all. It has been a busy week with us catching up and celebrating World Book Day. Congratulations also go to our award winners this week. Aaron Roche received the Good Work Award for all of his hard work in Year 5 as he leaves us.Zuzanna Leliwa received the Courtesy Award for always being polite and courteous. Athena Christodoulou received the Maths Award for her quick responses in mental maths and finally, this week our Star Writers were Dylan Butler and Marie Estanda for their book reviews. Remember that we are starting 'Alice in Wonderland' by Lewis Carroll next week - if you have a copy of the book, bring it along to join in during the lesson! You've all written some lovely New Year resolutions about what you'd like to do during the year and what your goals are too! They are now up on display in our classroom ready for your parents to look at in the next few weeks. The hard work over the last 5 weeks with your Jacqueline Wilson work has been evident from the work I have been receiving from you throughout the week too. Keep it up everyone! Party Day & Christmas Dinner! Cadbury World Have a look around where we're going on our Summer Term trip!! YouTube - Backstitch Video Use this to help you with your stitching homework if you've forgotten anything! The Giving Tree Read this with your parents to help with your talk homework this week. Hit the Button - Number Bonds Keep working on your number bonds!! Diocese Of Nottingham Find out about the Diocese we belong to and the important people who help and guide us. Anglo-Saxons What can you find out? Sutton Hoo Find out about this historic site linked to the Anglo Saxons. BBC Science Clips - Gases Around Us Linked to our current science topic. Phases of the Moon Calendar Can you track the changing phases of the moon? Melvin's Make a Match Equivalent Fractions! Tug Team Challenge the computer on your x table knowledge! Environmental Intelligence Unit Have a go at this game to see if you can reduce waste! Maths Zone More mathematical fun! Multiplication.com Keep working on those times tables!